As Ghaziabad Development Authority launched Indirapuram flats housing scheme 2014 on the auspicious day of Diwali now started accepting online application from 1st of November. In GDA Indirapuram flats scheme 2BHK, 2BHk Deluxe, 3BHK and 4BHK multistory flats available. Total 370 flats are offering by Ghaziabad Development Authority Indirapuram flats scheme. I have given the complete details regarding it keep reading to know everything about the GDA housing scheme 2014. The name of the scheme is “Indirapuram Nayaykhand – I Ten Story Flats Scheme” and the site is located in Indirapuram which is 2 Km. from Mayur Vihar, 3.5 Km. from Akshardham Temple, 1 Km. from Anand Vihar and just 200 meters away from sector 62 Noida. As GDA offering varied type of flats like 2BHK, 3BHK and 4BHK under the scheme they are offering maximum flats in157 4BHK which is highest among all categories flats. The prices of the flats are between 52.79 Lakh to 84.53 Lakh. according to choice of categories of flats. What is the Date of GDA Indirapuram Flats 2014 Scheme? GDA Draw Result Date: Lottery Draw of the scheme is proposed within 6 months. Who Can Apply for GDA Indirapuram Flats Housing Scheme 2014? Application age should be 18+ at the date of submission application form. One person can submit only one application. The applicant or his/her family (family means applicant, his wife/her husband and minor children) must not own any residential plot/house in any colony developed by Development Authority, Housing Board, Improvement Trust, any local body, co-operative society within National Captial Region (NCR). He/she must also not hold more than one plot/house developed by above said bodies in any other city/town of U.P. Both Husband and Wife can apply incase both are successful, only one can retain the flat. What is Registration Amount/Fee for GDA Indirapuram Housing Scheme 2014? The cost of application form is Rs. 1100/- which you have to pay along with the registration fee. The registration fee is 10% of the flat amount (For instance if you are applying for 2BHK which cost is Rs. 52.79 lacs then you have to pay 5,27,950+ 1100 = 5,29,000 at the time of registration). This price is for the general category if you are from reserved category then you have to pay 5% of the flat price with 1100 application form and Rs. 50 registration charges. The authority will give 5% discount on the flat cost to those applicants who pay full amount within 2 months after the allotment. What is the Cost/Price of Flats Offering by GDA? How to Apply for GDA Indirapuram Nyaykhand-1 Flats? You can apply for GDA housing scheme 2014 online only for detailed terms and condition of the scheme can visit the official website of GDA. To apply for Ghaziabad Development Authority flats visit the official site which is www.gdaghaziabad.com go to bottom of the page and click on the “New Property” link a new window will open and click on Fill Forms tab click here option and do the needful. 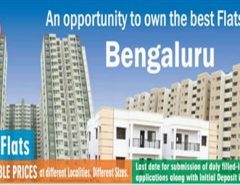 If you don’t want to follow the process then simply click on this link to apply http://gdaopis.cloudapp.net/Index.aspx but keep ready your documents before applying to know click on what documents required for GDA IndraPuram flats housing scheme. Hope everything is clear and now you can apply don’t forget to give your feedback in below If you do have any query regarding it please do let me know via your comment. Is it worth to purchase flat under scheme code 842 which is costing 54-60 lakh for 2bhk, because in Indirapuram Nyay Khand I location itself some builders are selling 2bhk at cost of 33-40 lakh. so can you pls tell me what to do ? Just go for the cheap and best Rohit.